Mendo Flow Dojo at CircusMECCA’s Halloween Party. Photo by Keith Wyner. It turns out that fall is just as busy as summer, if not more, and the changing seasons have certainly kept me on my toes. After our final festival trip of the year to Pacific Fire Gathering in September, we got right back to busily working our little tushies off. Weekends have been full of picking up extra work, jam jamming, and staying local, which has been so nice! We started October with a camping trip at Usal on the nearby Lost Coast for a friend’s birthday, and finished it with two shows in the bay area and then a kickass fire performance with our local circus school, CircusMECCA, at their Halloween street party in Mendocino. I’ve started canning for fall, cleaning up from one season and preparing for the next in the garden, and enjoying a little more time to catch up on things around the house. But after the busiest year of my life, the to do list is still long as the holidays approach and the festival production season kicks off again soon with Lucidity (tickets are just now going on sale at 9am 11/3… which means another cycle begins and I will be quite busy). And the bills never end, so crush mode must remain engaged! Fire Hoop at Once Upon a Festival. Photo by Zac Krohn / Clapping Porpoise Studios. With a bit more time on my hands, I’ve finally gotten around to creating a Facebook page for my flow arts performance persona, Twisty Pixie. Since James has had a page (Flicker) for a while now and we often perform together, I needed a place to gather photos & videos of my flow arts performances. I wanted to create something I can promote with and use as a contact point to get new performing gigs. Hopefully this is just the beginning. We have some pretty big dreams and it’s awesome to be getting such a great response when we share what we love doing with the world. Our Halloween performance was a lot of fun, and we busted out more props and a longer set than ever for our third year performing with the amazingly talented folks at CircusMECCA. We dressed as fire ninjas and James made a mix of kung fu inspired music, and though we’ve both been so busy that we didn’t get much practice time in before the show, we got a great response from the crowd and hopefully got some new locals interested in the flow arts. We continue to host spin jams in town on most Thursday evenings, and perform together under the same name as our spin jam group, Mendo Flow Dojo. Performing at Paige & Trent’s Wedding in May. We even made the front page of the local paper, Mendocino Beacon, (and page 5) with fire photos from our Halloween performance and Mendo Flow Dojo got a mention! Granted, Mendocino is tiny so making the front page isn’t exactly difficult, but still, fire spinning on the front page! Fancy pants! 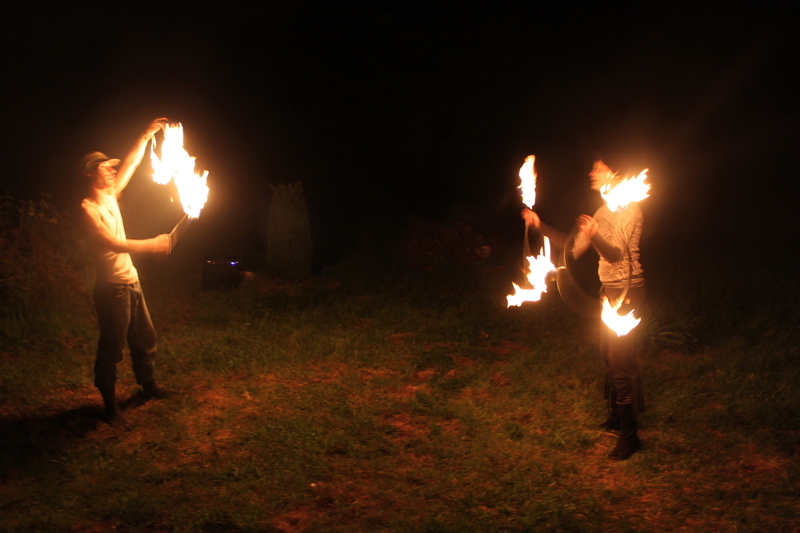 Our fire performance on Halloween made the front page of the Mendocino Beacon! Hopefully lots more fun gigs are in our future, a promo video, and a web site for fire performance and flow arts education. If we know any photographers or videographers who are interested in capturing fire performance and going on a few flow arts photo shoots in beautiful local locations, hit us up! We are hoping to collaborate on a few photo shoots and we’re always looking for help capturing our shows. Thanks so much for your support! James at our Mendo Flow Dojo Halloween performance. Photo by Keith Wyner.